Fricke, H. and Morse, S. The electric capacity of tumors of the breast, J. Cancer Res. 10, 340-376, 1926. Joines, W.T., Jurtle, R.L., Rafal, M.D. and Schaeffer, D.J. Microwave power absorption differences between normal and malignant tissue, Int. J. Radiol. Oncology Biol. Phys. 6, 681-7 (1980). Clarbruno Vedruccio: Polarizability of normal and cancerous tissues, a Radiofrequency Nonlinear Resonance Interaction non invasive diagnostic Bioscanner Trimprob detector alle pagg.177-185. O. Gokce, O. Sanli, A. Salmaslioglu, A. Tunaci, C. Ozsoy and F. Ozcan, Tissue Resonance Interaction Method (TRIMprob) has the potential to be used alongside the recognized tests in the screening protocols for prostate cancer, International Journal of Urology (Int J Urol. ), 2009 Jun;16(6):580-3. C. Vedruccio, A. Meessen, Nuove possibilità diagnostiche tramite onde elettromagnetiche, Fisica in Medicina (AIFM), 3: 225-230, 2004C. Vedruccio, Ultra High Frequency and Microwave Non-linear Interaction Device for Cancer Detection and Tissue Characterization, Proc. of Augmented Reality in Surgery, 1st European Summer School (ARISER) IFC-CNR , Lecce, Italy, July 4th-8th 2005: 8-12. C.Vedruccio, Non-linear Resonance Interaction. The Trimprob clinical trials , Minimally Invasive Therapies & Novel Embedded Technology Systems, The Text Book of The 2st European Summer School (ARISER) IFC-CNR , Santa Cesarea Terme (Le)Italy, July 17th-21th 2006: 119-132. C.Vedruccio, C.Ricci, The Trimprob Non Linear Resonance Interaction for early Cancer Detection, Casciaro S. and Samset E. (Eds.) 2007, Minimally Invasive Therapies and Novel Embedded Technologies, Lupiensis Biomedical Publications , Lecce, 2007:111-118. C.Vedruccio, Non Linear Resonance Interaction. Some New Applications of the Trimprob for Cancer Detection on Stomach-Duodenum and Other Organs, Casciaro S. and Samset E. (Eds. 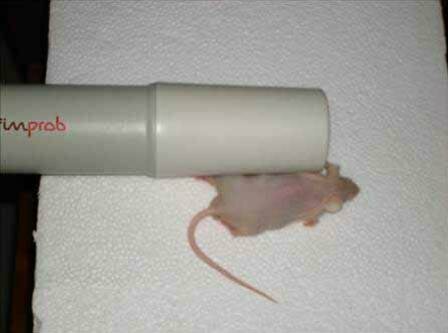 ), Minimally Invasive Therapies and Novel Embedded Technologies, Lupiensis Biomedical Publications, Lecce, 2007:22-26. C.Vedruccio, Polarizability of normal and cancerous tissues, a Radiofrequency Nonlinear Resonance Interaction non invasive diagnostic Bioscanner Trimprob detector, in L. Giuliani, M. Soffritti (Eds). 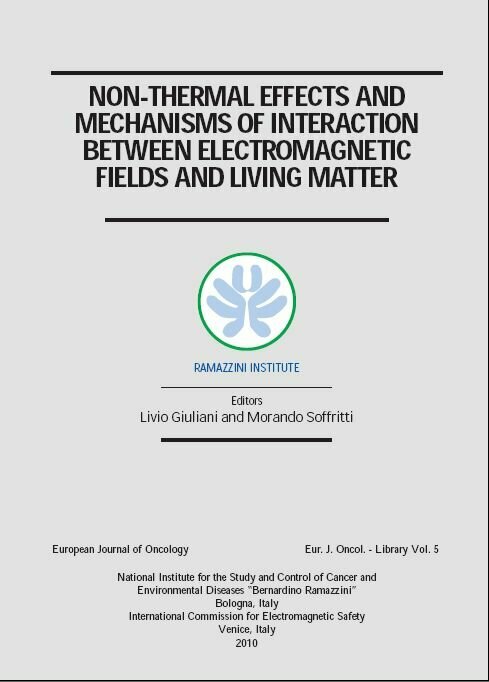 Non-thermal effects and mechanisms of interaction between electromagnetic fields and living matter, Mattioli 1885 spa, Fidenza, 2010: pagg.177-185. European Journal of Oncology - Library Vol. 5 (National Institute for the Study and Control of Cancer and Environmental Diseases “Bernardino Ramazzini” Bologna, Italy. M. Tufano, C. Vedruccio, Principi e applicazioni cliniche del TRIMprob in diagnostica. 41° Congresso Nazionale SIRM (Società Italiana per la Radiologia Medica), maggio 2004, Palermo. G. De Giorgi et al. Utilizzo del TRIMprob nella Diagnostica Non Invasiva del Tumore Prostatico. R. Ballario et al. TRIMprob e Biopsia Prostatica. Risultati di uno Studio Prospettico ‘Single Blind’. 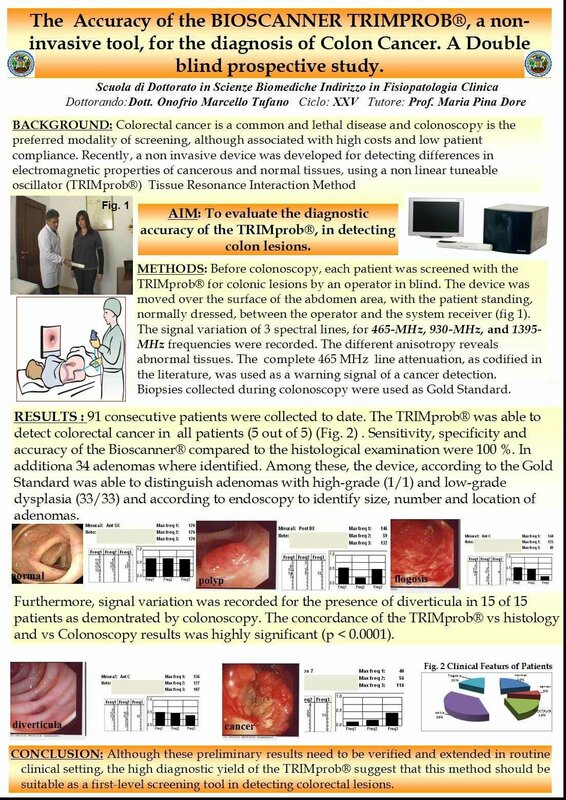 Marcello Tufano: XVII National Congress of Digestive Diseases (Gastro-enterology), 5 to 9 March 2011, Torino, Poster Session: "The Accuracy of the BIOSCANNER TRIMPROB®, a non-invasive tool, for the diagnosis of Colon Cancer. A Double blind prospective study". We encourage medical doctors to report their publications and their lectures papers to enter this site.